Firestop is a highly effective fire retardant VPT product which improves the performance of timber and plywood when exposed to fire. Wolmanit Firestop treated timbers will comply with all relevant international fire standards (e.g. EN13501-1: class B s2 d0), thus giving architects a wide choice in fire-related timber applications. Timber treated with Firestop is suitable for interior and exterior applications and the most typical uses include internal wall and ceiling linings, external claddings, roof constructions, transportation, wooden scaffolding and pallets for the chemical industry. It controls ignition of fire, impedes flame spread across the wood surface and lowers the heat release from the wood-based substrate. Treatment is carried out by WJ Components in Hull which is the only facility to offer this fire retardant timber treatment in the UK. There is a lead in time of 2 to 3 weeks for this treatment. 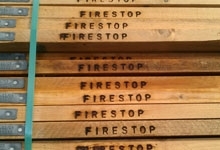 It is recommended that boards treated with Firestop should be painted over or stained in addition to the treatment. B: 'NON-COM EXTERIOR' from Lonza Wood Protection. This is a tried and tested fire protection for timber which has been used for over 40 years to provide assured leach resistant surface spread of flame protection for timbers used in exterior situations. Applied under controlled conditions in an industrial treatment vessel the treatment is impregnated into all faces of the timber and unlike coating products needs no further maintenance. Non-Com Exterior treatment has a proven durability of over 30 years in building situations and is the only fire retardant treatment accepted by the NHBC for exterior cladding timbers. The lead in time for this treatment is about 5-6 weeks. Click this for a link to the Non-Com Exterior page of the Lonza website which includes a Specifiers Guide document. 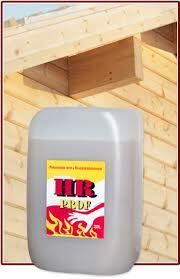 C: 'HR-PROF' from Fire Retardant UK Limited. This is a water based product which is easy to apply and possesses high diffusion properties so that it quickly penetrates the surface of the timber substrate. It does not require a protective finishing coat and can be left natural, or if specified, over coated. HR-Prof does not react with galvanised steel, gun nails or zinc coated screws and it can be used both internally and externally. This treatment has been approved on many contracts in the UK as an equivalent to British Standard Class 0 (equivalent to Euro class B Spread of Flame). The lead in time for this treatment is around 2-3 weeks. Click the link to see the HR-Prof Guide Document . The main difference between the types of treatment is the lead time for the product to be applied. Call us on 01472 350151 for advice or a quote on any of these treatments. All technical data for these fire treatments is available on request.